Current Herpetology publishes original research articles on amphibians and reptiles. 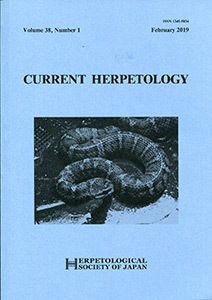 It is the official journal of the Herpetological Society of Japan and is a continuation of Acta Herpetologica Japonica (1964–1971) and Japanese Journal of Herpetology (1972-1999). Join our society for subscription. See below for how to access the fulltexts of the online editions. Any one can read abstracts and references. Full text are accessible from subscribing organizations. There are period-specified services for authors now. See here. Copyrights of articles published in Current Herpetology belong to The Herpetological Society of Japan. Uploading their PDF offprints within 2 years from the publication to the ResearchGate site or any other personal websites open to free downloading by the general public is an obvious violation of copyright transfer agreement which the authors sign before their publication. Please wait 2 years for making PDF offprints accessible on websites. See Order page if you need hard copies (see above for online editions).